Many have debated on the differences between a leader and a manager (Yukl 2010). . Some suggest that one can’t be both at the same time, whereas others simply view them as different roles that may be executed by the same person. I’m inclined toward the latter, because that’s what my clients seem to be telling me. Companies don’t really care about theoretical debates, but rather what works. It’s not all about setting a vision, but it’s also about execution. It’s not just about inspiring people, but also exercising control and accountability. It’s not always about strategy and planning, but also risk-taking and innovation. Sometimes change is required, whereas in other times stability is necessary. What a leader regularly encounters is simply a whole lot of mess, that can’t be readily categorised as a “leadership” or “managerial” issue. The problems and challenges are dynamic, and often paradoxical in nature. If that describes your situation, take a look at the following model. The leadership model groups two of the leadership roles within each of four quadrants. 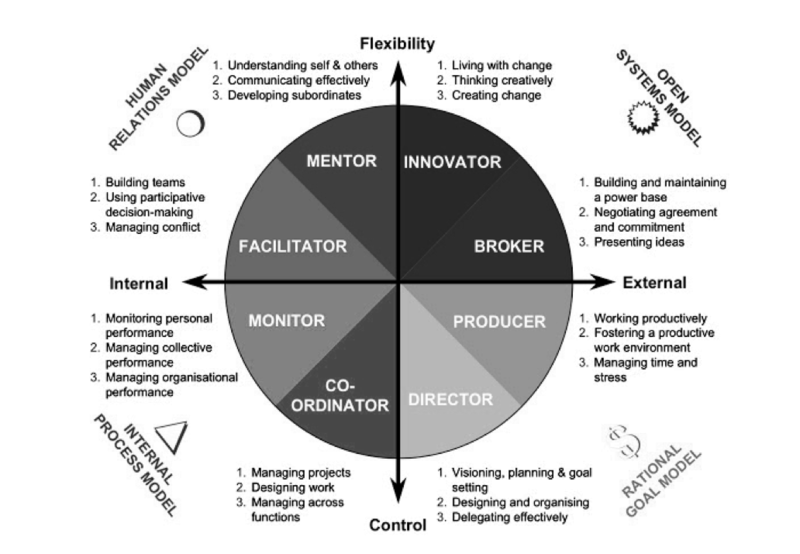 The upper-right quadrant, which the effectiveness framework links to open-systems theory and the process of adaptation to the organisation’s external environment, defines two leadership roles. Innovator Role: The innovator is creative and envisions, encourages, and facilitates change. Broker Role: The broker is politically astute, acquires resources and maintains the unit’s external legitimacy through the development, scanning, and maintenance of a network of external contacts. Moving clockwise to the lower right quadrant, labeled the rational goal model in the effectiveness framework, two more leadership roles are specified. These roles emphasise the rational pursuit of goals external to the group, and the leader’s role in defining and motivating the attainment of those goals. Producer Role: The producer is the task-oriented, work-focused role. The producer seeks closure, and motivates those behaviors that will result in the completion of the group’s task. Director Role: The director engages in goal setting and role clarification, sets objectives, and establishes clear expectations. The lower left quadrant is referred to in the effectiveness framework as the internal process model and places primary emphasis on internal control and stability. Two additional leadership roles are specified in that quadrant. Coordinator Role: The coordinator maintains structure, does the scheduling, coordinating, and problem solving, and sees that rules and standards are met. Monitor Role: The monitor collects and distributes information, checks on performance, and provides a sense of continuity and stability. The upper left quadrant is referred to in the framework as the human relations quadrant, placing primary emphasis on human interaction and process. Two final leadership roles are defined within that quadrant. Facilitator Role: The facilitator encourages the expression of opinions, seeks consensus, and negotiates compromise. Mentor Role: The mentor is aware of individual needs, listens actively, is fair, supports legitimate requests, and attempts to facilitate the development of individuals. The CVF model has been widely tested and studied for more than 25 years and has been named as one of the 40 most important frameworks in the history of business (Cameron 2006; Ten Have, Elst & ten Have 2003). Further information on this can be found in the book Becoming a Master Manager: A Competing Values Approach, 5th Edition (http://au.wiley.com/WileyCDA/WileyTitle/productCd-EHEP001762.html). Denison, DR, Hooijberg, R & Quinn, RE 1995, ‘Paradox and Performance: Toward a Theory of Behavioral Complexity in Managerial Leadership’, Organization Science, vol. 6, no. 5, pp. 524-40. Quinn, RE 1984, ‘Applying the competing values approach to leadership: Toward an integrative framework’, Leaders and managers: International perspectives on managerial behavior and leadership, pp. 10-27. Ten Have, S, Elst, Mv & ten Have, W 2003, Key management models, Financial Times Prentice Hall. Yukl, GA 2010, Leadership in organizations, 7th ed. edn, Prentice Hall, Upper Saddle River, N.J. Previous Post Is it “Leader” Development or “Leadership” Development? Next Post Successful Managers Don’t Do What Effective Managers Do?